In the new paradigm of work and learning, have we given sufficient thought to the teacher workspace? In the last couple of weeks I have had tours of city workplaces, particularly in the banking sector, that are opting for the activity-based work (ABW) approaches to organising their people and spaces. ABW does away with a personal workspace for each employee, while providing different spaces for various work functions, including collaboration, learning, focusing, and socialising. Read more. Activity based working in a building is really characterised by a different environment, different spaces, different settings for people to either concentrate individually or to collaborate with a couple of people together. This all makes sense. 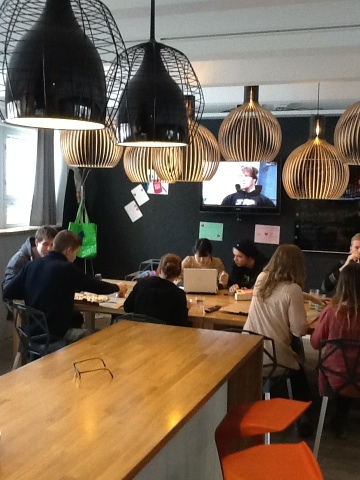 It looks and feels like the open learning spaces in school – for the students, but has the teacher own workspace kept up? What could a teacher’s workspace (other than the learning space) look like? In the ABW environment the employees have choice, very similar to what many of us advocate for our students. Workspaces are not owned, people have lockers for their gear. There are kitchens, shared tables, quiet nooks and meeting areas. There is no mess, nothing left out at the end of the day and, over time, personal responsibility taken. Generally in these buildings there are 75% of spaces for the number of people who work there – with city office costs, it provides a significant saving on the cost of business. The actual place of work depends on the project at hand and who they need to work alongside. The kicker was an increase in the work/life satisfaction level, which jumped from 10 per cent before the move to 72 per cent. Almost 80 per cent of employees said they were inspired by their new environment. How are we providing the physical context to make this happen, and then help teachers shift in their thinking from privatising work and learning to a shared and collaborative culture. Education has a lot to learn from activity-based work. It requires a significant mental shift in ownership from ‘my space’ to ‘our space’, from paper-based resources, to digital and cloud storage. It takes time and determination. We are preparing our young people for a world that relies more on the 4Cs, once they’ve mastered the 3Rs. By rethinking the way that teachers work, we are helping them understand the reason why the way students learn may need to change. Ultimately, they just might enjoy it as well. Thanks, Anne – a great post to start the ball rolling on this much overdue dialogue about teacher workplaces and how they synch with the 21st Century school landscape. Those inspired to think further on teacher workspaces might be interested in my recently launched PlaceShaping Project (http://placeshaping.wordpress.com) and follow it as it develops over the next year.